I love this stone and I have many through my home and in my own personal collection of jewelry. 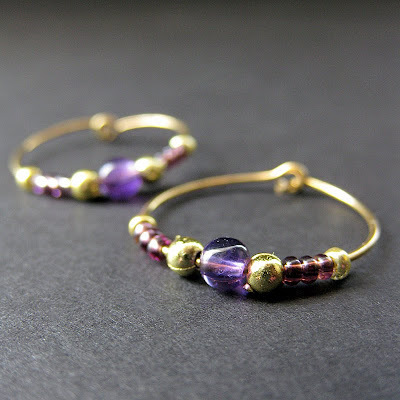 When a customer from Malaysia contacted me asking for something delicate, elegant and purple, the inspiration for these beautiful Amethyst hoop earrings were born! Amethyst is one of the most well known gemstones in the world and was once coveted by ancient priests and priestesses as well as by royalty. Metaphysically, its strongest attributes are believed to be the ability to calm that which is disturbed, to ease transitions and to fend off psychic attacks. It’s a very common and reliable crystal that's often used for meditation, dream work and ritual. The calming power of amethyst assists in soothing a person into a calm and restful dream state and, because of its ability to fight off psychic attack, it's believed that it can protect a person from disturbed sleep and nightmares. It's also known to be very helpful in bringing about clear and lucid dreams during the sleep state. 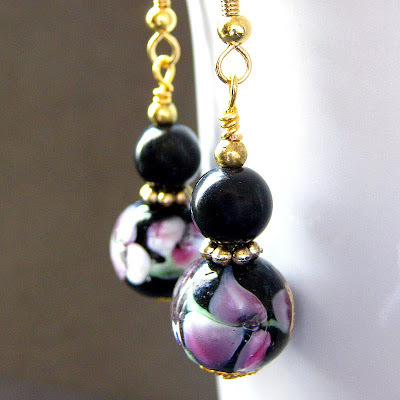 These vibrant handmade gemstone earrings are made from genuine Amethyst gemstone rounds accompanied by purple and gold seed beads, all set to dangle on a set of gold plated hoops. Made with care to be light-weight and delicate, these 0.78-in (2 cm) hoop earrings are easy to put in and take out with a safety hook clasp so they won't fall out and get lost inconveniently. 'Cause I'm going to Lavender Fields. My grandmother used to sing The Beatles song "Strawberry Fields" with lavender replacing strawberry in the lyrics. I'm not sure why, maybe it was because she loved the scent of lavender but it turns out that her version stuck with me, and whenever I hear the song, I too now replace strawberry with lavender in the lyrics. 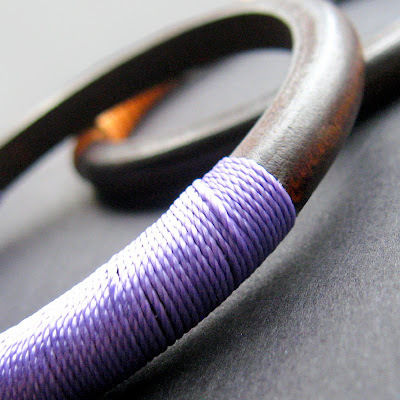 This lavender fiber wrapped wooden bangle bracelet was made in honor of my grandparents. The color, for my grandmother and her love of lavender and the wood for my grandfather and his passion for wood working. This bracelet is made from a hand-turned wooden bangle that has been stained a deep walnut, then wrapped in silky nylon fiber for a splash of vibrant color. I've made these fiber wrapped wooden bangle bracelets in a variety of colors as part of a "Fiber and Wood" series and many of them have matching necklaces as well, but it's the lavender ones, especially, that bring back wonderful family memories as they were created and it's a pleasure that I can share a piece of my family and my past with those that wear them. The bracelet is 20cm in circumference on the interior. 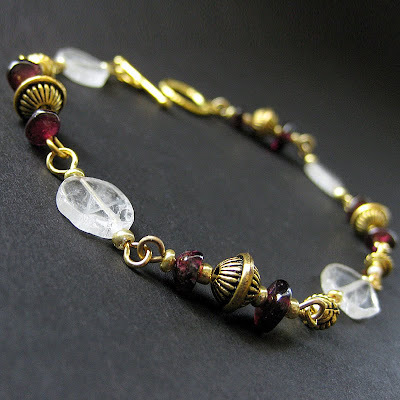 Tumbled nuggets of garnet stones linked to shimmering pink disks of rose quartz and decoratively designed gold plated beads grace this golden handmade gemstone bracelet where each and every link has been hand-turned with care. Garnet is known as the stone of passionate devotion. To your family, your friends, yourself, and your purpose or goals . It's believed to be very good for career success, encouraging business relationships by increasing a person's popularity and stimulating other peoples desire to work with you. Rose quartz is a stone of warmth and love and is believed to gently heal emotional wounds and pain like a calming salve. The stones are thought to opens the heart to the beauty within and all around us and begin its healing by reducing resentments. Brought together in this bracelet, these two stones harmonize well and make for not just a beautiful piece but a beautiful sentiment and purpose as well. This beautiful gemstone bracelet is then finished off with a matching toggle clasp, creating the perfect accent piece for whether you want to dress up a casual outfit or accent an elegant ensemble. Bracelet is 8.2" (21 cm) in length including clasp.